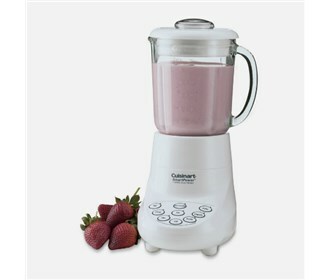 The Cuisinart SPB-7 SmartPower& #153; 7-speed electronic blender blends, purées, chops, mixes, and liquefies all with the push of a button, and crush ice with no liquid added. It has seven speeds settings as well as a pulse button that can be used at every level. The SPB-7 features stainless steel blades, a 40-ounce glass jar with dripless spout, ice crusher capability, touch pad controls with indicator lights, and a leak-resistant cover. The Cuisinart SPB-7 has many exciting features for users of all types. The Cuisinart SPB-7 is sold as a Brand New Unopened Item.